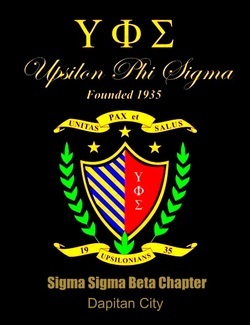 Upsilon Phi Sigma (YΦΣ, commonly known as UPS) is a National Inter-University and Collegiate Fraternity and Sorority with 164 active chapters. Founded at the University of the Philippines Los Baños in February 14, 1935, it is one of the oldest fraternities and sororities in the Philippines. The organization practices many traditions. The most important of these traditions is the giving of 100 red roses every Valentine's Day during the Founding Anniversary. This is guided by the Latin motto, Unitas, Pax, Et Salus! ("Unity, Peace, and Prosperity for All!"). The organization's official symbol is the shield, signifying the strong establishment of the organization in the early 1900s. Due to the active expansion efforts of the members, Upsilon Phi Sigma continues to offer humanitarian services to the schools and communities of the Philippines. Upsilon Phi Sigma Honor and Excellence Service Fraternity was originally organized by seven students from different colleges of the University of the Philippines on February 14, 1935 (Valentine's Day) purposefully, to emphasize its concepts of love and peace. This foundation day is a very important day in the lives of many Upsilonians. Since then, it has been celebrated annually with many activities, as well as renewals of fraternal vows of commitment and dedication to the UPS ideals. On May 14, 1935, the Seven Founders and other original members wrote a comprehensive Constitution and By-Laws document encompassing the fraternal principles, concepts of love and peace, and doctrines of self- and organizational disciplines, under the motto of Honour, Service, and Excellence in all its activities. Since then, the Fraternity has also promoted its adherence and respect to the ideals and authorities of the Republic. Many students from various schools in Metro Manila clamored to be admitted to the newly organized Upsilon Phi Sigma, which had decided by that time to include women in its roster of membership to constitute the Sorority. From that time on, the Upsilon Phi Sigma Fraternity and Sorority has expanded its membership and leadership with hundreds of chapters organized not only in Metro Manila but in areas of Luzon, Visayas, and Mindanao. At present, it also has chapters and alumni groups in other countries like Australia, New Zealand, the United States, Canada, Germany, Taiwan, and Saudi Arabia; and community chapters in Kota Kinabalu, Malaysia and other parts of Asia. In Silliman University we were established in the 1980's with 3 upsilonians coming from 3 universities - according to one of the pioneering Grand Archon Brod. Richard Limuaco. Then there were 3 waves of existence 1st generation - was the time wherein they initially registered to be a fraternity/sorority organization in Silliman University. Which was lost during the martial-law era, due to the prohibition of GREEK organizations in the Country. The 2nd Generation - was the time wherein the batch of Brod. Joel Pasok -now in Bohol, existed... but they eventually went exit because of the strength of the number, but these were mostly graduating, and after graduation UPS in Silliman was temporarily -on dead tango! The 3rd generation - was the coming of a great organizer from Central Philippine University, in the name of Brod. Jeremy Jordan, he together with some alumni initiated the 7 Balls, which turned out to be the pioneering batch consisting of a few sillimanians - Sis. Hanah, Brod. Rap Rap and Sis. Kareen... And then the story just goes on and on. Presently called Sigma Sigma Beta Chapter - Jose Rizal Memorial State University in its 3rd generation of members, has produced around 40+ alumni and has an active student membership of 18.